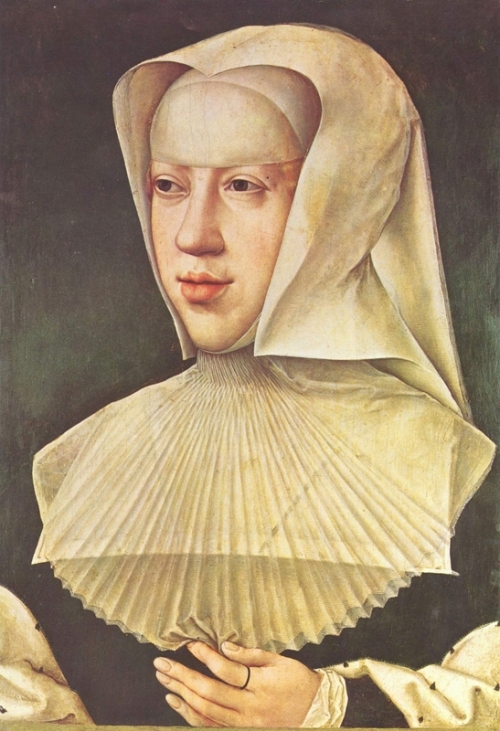 Margaret of Austria, the daughter of Maximilian I, Holy Roman emperor, was betrothed to Charles VIII, future king of France, at the age of two. She was sent to the French court to be raised under the tutelage of Charles’ sister, Anne of Beaujeu, who was by then acting as regent during his minority. Anne convinced Charles to repudiate the marital arrangements with Margaret in favor of a more diplomatically profitable union with Anne of Brittany. Margaret was restored to the custody of her father in 1493 and the matrimonial maneuvers resumed. She was married to Juan, heir to King Ferdinand II of Aragon, but widowed a few months later at the age of seventeen. Her next marriage, to the duke of Savoy, lasted only three years (he died in 1504) and Margaret vowed to remain a widow. In 1507, she was appointed regent of the Netherlands for her nephew, the future Charles V, Holy Roman emperor, and functioned in that capacity almost continually until her death in 1530. A gifted administrator and tactful diplomat, Margaret built her court at Mechelen into one of the most renowned in Europe for its patronage of arts and letters.